It operates roughly twice as efficiently, and substantially more cleanly, than the open fire cooking methods still used in many areas of the world. Furthermore, the design of the stove requires small diameter lengths of wood, which can generally be satisfied with small branches. As such, sufficient fuel for cooking tasks can be gathered in less time, without the benefit of tools, and ideally without the destruction of forested areas. Because these qualities improve local air quality, and discourage deforestation, the rocket stove has attracted the attention of a number of Appropriate Technology concerns, which have deployed it in numerous third-world locales (notably, the Rwandan refugee camps). This attention has resulted in a number of adaptations intended to improve convenience and safety, and thus the size of the target audience. 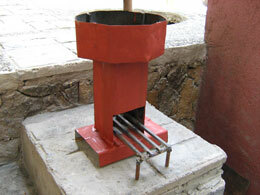 The Justa Stove, for example, is a cousin of the rocket stove adapted for indoor use and family cooking needs. A rocket stove addresses the environmental problems of using an open pit fire for cooking and home heating, the most important concern being indoor air quality. Biomass fuels release large amounts of air pollutants when burned on traditional open pit fire, and these pollutants become concentrated in inadequately ventilated homes and dwellings. Another concern with traditional wood fires is the inefficiency of fuel consumption. Traditional open pit wood fires are very efficient at turning wood into energy, but inefficient at transferring the released energy into the cooking vessel. Most of the released energy in the wood is wasted heating the surrounding air rather than heating the cooking vessel. The inefficient transfer of energy requires the use of more wood, which has to be harvested from the surrounding environment, causing environmental stress. The third drawback of traditional wood fires is the danger to children. Because open fires are located on the floor of the dwelling, children can easily fall into the fire. The main justifications for rocket stoves are economical, social, and environmental. Stove programs can produce economic benefits, saving time and money for the users. In urban areas where people purchase biomass fuel, the payback time for the cost of a rocket stove is short, thus saving on the cost of fuel. The most important factor, metering the fuel, requires only the burning portion of the wood to be heated. Fully burned biomass fuel produces less smoke and emissions. The main way to improve the fuel efficiency of rocket stoves is to improve the heat transfer from the fire to the cooking vessel. Most importantly, the hot air and gas released from the fire must contact the cooking vessel over the largest possible surface area. This is accomplished through the use of a pot skirt that creates a narrow channel forcing hot air and gas to flow along the bottom and sides of the cooking vessel. Heat transfer can also be increased by using wide pots. Increasing the speed of the hot gases that flow around the pot can also improve heat transfer. Rocket stoves are insulated and lifted off of the floor. This reduces the danger of children burning themselves, which is an important improvement over traditional open pit fires.